Wesa Chau (BE (SoftEng)(Hons) 2004 / BCom 2004) is as passionate about the benefits of cultural diversity within organisations, as she is about Chinese philosophy and the importance of having balance in your life. She also believes the only way to truly succeed in your career is to find what makes you happy. You are a Director at ‘Cultural Intelligence’ – can you tell us about the organisation, and how it works? In a multicultural society, cultural diversity increases the complexities of how organisations relate to clients and stakeholders. Cultural Intelligence helps build organisational capacities to deal with these complexities sensitively. Cultural Intelligence is a specialist consulting firm with cultural diversity experts from a range of professions. We combine academic understanding with real world experience to come up with solutions for businesses and individuals. There are different types of projects we get involved in. For example, research - where we develop and conduct research with people from diverse communities. The best time to get involved in any research is during its design phase to ensure the right questions are asked - so our impact is limited when cultural diversity is an after-thought. How best would you describe your career so far? I don't have a linear career progression. Being able to learn in any work I do is very important to me. If I am not learning in the role, I really should move on and take on new challenges. For that reason, a linear progression does not really fit my personality, but that comes with risks too. HR managers do not understand non-linear CVs, so now I cannot simply apply for jobs and it does limit my opportunities. However when the jobs come, they are interesting jobs that (again) challenge me and help me build new skills. 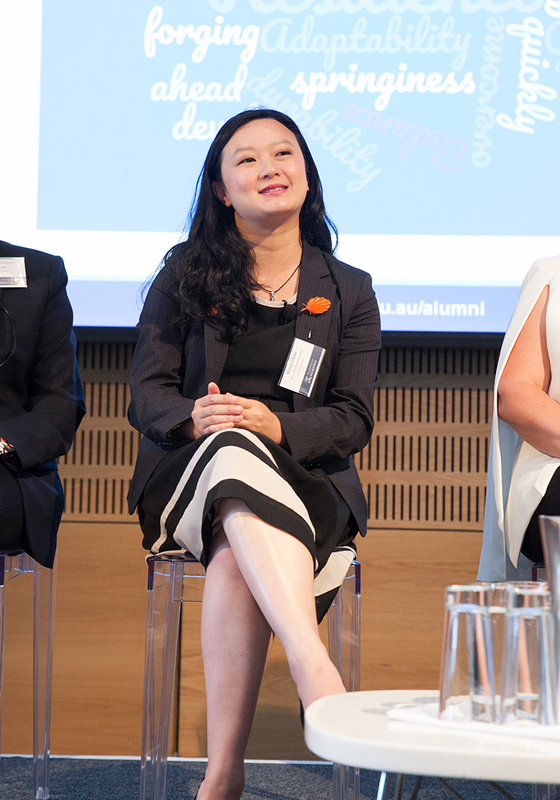 Wesa Chau on the panel at the 2017 alumni women’s lunch. You’ve won a string of awards throughout your career, including the Australian Leadership Award 2013, and the Young Victorian of the Year in 2010… what drives you in your work? Cultural diversity is my passion and it is also my identity, so my drive is the desire to really see Australia embracing the power of diversity. I see myself as a bridge between everything and in everything I do - bridging cultures, as a bridge between international students and local communities, and as a bridge between not for profit organisations and corporate companies. I studied Commerce and ended up in the not for profit sector / politics. I am also flexible and fluid which helps me understand the real needs of people. I enjoy learning and putting myself outside my comfort zone just to challenge myself. How was your time at Melbourne University, and how has your degree helped shape your career? I loved my time at the University of Melbourne. It was how my career really started. I was involved in clubs and societies. I remember that was one of the reasons why I picked Melbourne over other universities - I was at the open day and saw how fun University life can be! I later started the Australian Federation of International Students because so many of my friends were international students. Whilst I didn't end up working in the commercial world, the skills I learned at university have really helped me. I majored in Marketing and Management and these skills still come in handy. Another way the University of Melbourne helped me was through my involvement in the clubs - I gained the practical experience I needed and in many ways it gave me a head start because of the experience I already had. What advice would you give to young women out there just starting in their careers after graduating from the Faculty of Business & Economics? Do as many things as you can (within your capacity) when studying. If money is not the biggest concern, spend more time volunteering and do work that teaches you practical skills. It is much better to volunteer in a large project where you can learn skills than to earn money in a repetitive job. Find out what you really enjoy and who you are. The process will take time, but keep asking yourself what makes you happy. The answers will help drive your career. I thought I knew the answers at 25, but I only really know at 35, and that answer might change again when I reach 45… and maybe at 75 I will decide that it is only then I know for certain.